"The Reception and Transitional Processing System provides a realistic, detailed and soon to be costed reform of the immigration detention system which resolves many of the serious problems that currently exist. It enables the Australian government to process people with integrity and confidence." Image: the schematic diagram of the proposed Reception and Transitional Processing System: click the image to open a larger version. This page details the Executive Summary and the Conclusions of the paper. It's also available for download from the page as a PDF file - see below. Grant Mitchell is the Co-ordinator of the Asylum Seeker Project at the Hotham Mission in North Melbourne. 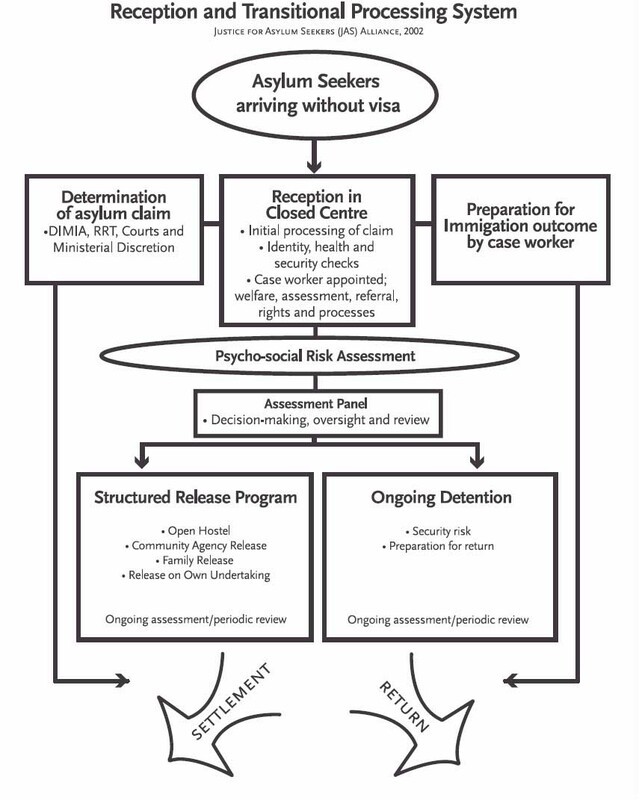 He discusses and presents a paper outlining an initiative by the Justice for Asylum Seekers Alliance Detention Reform Working Group that looked at Alternative approaches to asylum seeker policy, more specifically the Reception and Processing System. The paper with the same name, Reception and Transitional Processing System, was published in June 2002 by the Alliance. Justice for Asylum Seekers (JAS) is an alliance of over twenty five national churches and community organisations founded in Melbourne in 1999 to address negative perceptions of refugees claiming asylum. JAS is concerned with achieving just treatment of people claiming asylum in Australia while acknowledging the need for border management and sound migration processes. 1 August 2003: Grant Mitchell, The Swedish Model of Detention - The decision by a state to detain individuals without valid visas, adequate identification or immigration clearance raises numerous arguments. The Swedish practice of detention should be seen as a model for other countries, not only in its ability to quell unrest and create a safer working environment, but also in how to treat and respect those detained. 7 December 2002: The Mudgee Muster: Rural Australians for Refugees, its Mudgee National Get-Together - 'We might have had the idea, but unless you'd turned up in your numbers and proved to be the energetic, dedicated, passionate people you are, Rural Australians for Refugees would still be just an idea.' The Events' Program, Report, and Presentations of various speakers at this event. 7 December 2002: The Mudgee Muster photos: RAR Supporters and Friends in Mudgee - Some casual shots, by Grace Gorman, of the Mudgee RAR get together: From politicians to refugees, they were all there! 7 December 2002: Chilout's Kate Gauthier at the Mudgee RAR Conference: The Cruel Facts - We must fight this government policy with every method at our disposal, which includes acts of civil disobedience. Every one of us has a skill or a resource available to us for this fight. It is our duty to our fellow humans to find this skill, and more importantly, use it. 7 December 2002: Martin Ferguson MP outlines Labor's Asylum Seekers and Refugee Policy - Labor's new policy for asylum seekers and refugees is a better way of protecting Australia and a better way of meeting people's legitimate concerns about how this nation is treating individual asylum seekers. The policy addresses three important strategies - protection of Australia, a new processing system and treating asylum seekers decently. 7 December 2002: Australian refugee policy: past and present, warts and wounds - Margaret Piper, Refugee Council of Australia, speaks at the Mudgee National Rural Australians for Refugees Get-Together. "At first glance, refugee policy is much the same as Tehran traffic: complex, chaotic and behaving like an untethered hose. It is only when you understand the complex interplay of international and domestic factors that you can perceive that there are rules..."
Detention should only be used for a limited time, in most cases for Identity, Health and Security (IHS) checks upon arrival; prior to a person being returned to their country of origin or another country, or if a claim is unsuccessful and if supervision in the community is inadequate to the high risk of the person absconding. Introduction of a monitored release regime based on a revised risk assessment - made into community hostels/cluster accommodation. Those deemed high security risk to remain in detention, but with set periods of judicial or administra-tive review. Ensuring children and their primary carers are released from detention as soon as possible. Reception of all unaccompanied minors, families, single women, vulnerable people into community care with Government support and compliance requirements. Reception of all people assessed to be psychologically vulnerable into community care by specialised services with Government support and compliance requirements. Creation of a case worker system whereby an independent service provider (e.g. Australian Red Cross) provides information, referral and welfare support to services to people claiming asylum, from the time of their arrival to the point of repatriation or settlement in the community. Creation of a Representative Assessment Panel to oversee conditions of detention and community release. The Panel would make decisions on risk assessments, security compliance and periodically review length of detention. The Panel would act as an independent body ensuring transparency and accountability of service providers entrusted with the humane manner of treating people. The introduction of a specialist service provider such as International Organisation of Migration to manage return of persons whose claim has been unsuccessful. The creation of a special visa class for long term detainees who can't be returned to their country of origin, which would allow them to live in the community until such time as they can be returned. Ensuring from the outset that the asylum seeker is aware of the immigration process, has access to legal counsel and is thus more likely to feel like they have had a fair and expeditious hearing. The caseworker role in exploring and preparing clients for all possible immigration outcomes. By providing 'motivational counselling', including coping with a negative decision, preparation to return and empowering clients to make decisions. On a final decision and following a risk assessment, the panel decides as to whether the asylum seeker needs to be detained. Providing incentives for those who choose to voluntarily repatriate, including allowing time to find a third country of resettlement, paying for return flights, including domestic travel and allowing for some funds for resettlement. Allowing for Red Cross, IOM or family members to meet them on arrival and if appropriate follow-up post-return to ensure the safety of those returned and to safeguard future determination decisions. Australia's Existing Alternative to Detention: Each year thousands of people claim asylum and are permitted to live in the community by the Australian Government. They arrive with a valid visa and then claim asylum and the Government does not detain them. They go through exactly the same claim process as those who arrive without a visa and are held in detention. Cost of Detention: An indicative break-down of 1999-2000 costs to the public of detaining people shows that it costs much more than the Government's existing programs for processing and monitoring asylum seekers in the community. In 2000 - 2001, the cost for detention was approximately $104 million, increasing to $120 per day in 2002. It cost approximately $150 million in 2001-2 to detain 3500 people in mainland detention centres. Cost of DIMIA's Programs for Asylum Seekers in the Community: Many asylum claimants living in the community are eligible, for a period of time, for the Government funded Asylum Seeker Assistance Scheme (ASAS) which is managed by the Australian Red Cross. In 2000-2001, there were 2,691 people claiming asylum who received ASAS payments. ASAS averages 89 per cent of the Centrelink special benefit. A single male over 21 is paid approximately $400 per fortnight on the scheme, while a couple without dependants is paid approximately $600. Administration costs for the scheme run at an average of 12 per cent. It cost the public purse $11,185,000 in 2001. The Government's existing processing system for asylum seekers in the community is much cheaper than mandatory detention. Absconding: DIMIA evidence shows that the fear of absconding is exaggerated. No unauthorised asylum seeker released on a bridging visa in Australia from 1996-1998 failed to meet their reporting obligations to DIMIA. The RTP system has a risk assessment system which minimises absconding. Compliance: Currently, there are two types of compliance - implicit and explicit for asylum seekers allowed by the Government to live in the community. Implicit compliance includes the reliance of the asylum seekers on welfare agencies for their survival and involves, for example, asylum seekers reporting to the Australian Red Cross to receive payment of ASAS allowance as well as referrals. Explicit compliance is standard reporting requirements to DIMIA Compliance offices. 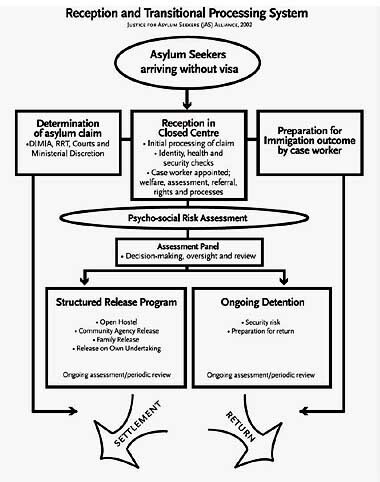 The Australian criminal parole systems in each state provide a wealth of reporting models for asylum seekers in the community. The RTP System improves DIMIA's existing compliance system through the use of risk assessment systems, rational consideration of rates of absconding in Australia and overseas; enhancing the role of DIMIA's Compliance unit, employing case management by welfare agency and an independent case assessment panel. The involvement of caseworkers and other community agencies in this system ensures visibility and accessibility and contributes to the asylum seekers meeting their compliance requirements with DIMIA. This is in addition to any explicit reporting requirements DIMIA might make. The Reception and Transitional Processing System aims to oversee the transition from a detention to a reception regime, based on a comprehensive risk assessment, case worker support, assessment panel oversight and implemented according to specific process stages. JAS is convinced of both the need and the ability for Australia to move towards a balanced detention/reception system. We believe the RTP System includes a number of elements that enable both a humane and flexible response to asylum seekers, while providing reassurance for decision-makers and the wider community. If the person is a high risk to abscond and supervision in the community is deemed inadequate. Furthermore we believe the risk to abscond for most asylum seekers is exaggerated. Evidence from Sweden, USA, Hotham Mission and Australia's various parole models, show this is to be the case. With ongoing case management, individual risk assessment and a structured release program, we believe most asylum seekers can be released into the community with supervision and compliance requirements. Issues of national security and border protection are concerns for all Australians. However, placed in the context of initial closed detention and adequate health and security checks, these issues should not be a hindrance to the release of those not found to be a security risk. This is particularly highlighted with cases such as unaccompanied minors and single mothers and children. Allowing for a humane and balanced approach to asylum seekers during the determination process. Positive outcomes for a system such as this are already highlighted by the work being done at Hotham Mission. A primary challenge is the need to bridge the enormous differences between current detention and community practices. Any realistic attempt to discuss alternative detention models in Australia must address this gap and attempt to find linkages between detention and community. This includes not only practical issues such as housing and health options in the community, but also larger issues of community education and understanding. The transition from a detention-based regime to a reception-based regime will be a process that requires critical evaluation, realistic alternatives and analysis of service provisions, costing, administrative and procedural responsibilities and an ability for community and Commonwealth to work together. The Reception and Transitional Processing (RTP) System provides a realistic, detailed and soon to be costed reform of the immigration detention system which resolves many of the serious problems that currently exist. It enables the Australian government to process people with integrity and confidence, moving vulnerable people, particularly children, families and the traumatised, into the community where they can be supported and easily monitored.